As one of the first to embrace the technology in the late 1970’s, we continue to install and maintain EPDM, PVC, and TPO low-slope roof systems. We have installed 14,832,759 square feet of Carlisle Single-Ply roofing since 1980 on residential and commercial buildings. Projects included from Commercial, Residential, Green Roof, Architectural Sheet Metal. For more information on a certain project, click on the photo to link to our website for additional photos. Over the last thirty years, Steve held many titles including roofing installer, foreman and estimator. 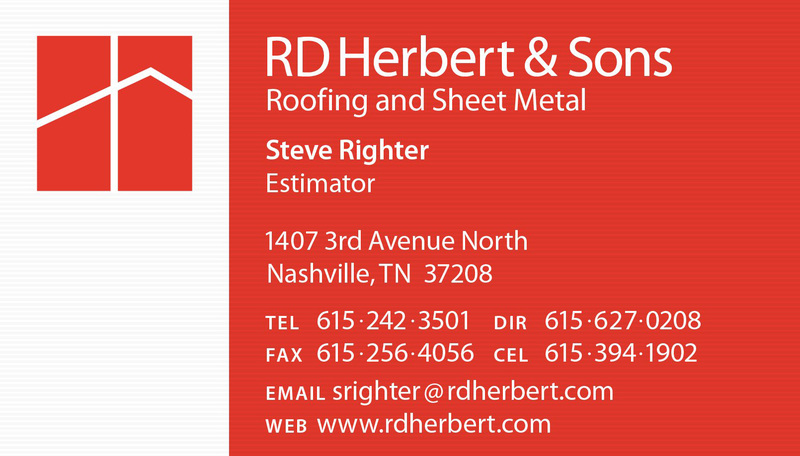 He also owned his own roofing business for twenty-three years in Chattanooga prior to joining our firm as an estimator in 2007. He has a Bachelors of Religious Education from Tennessee Temple University. His overall estimating duties include sales and estimating, design and specification, supervision, approving submittals and work orders and developing and maintaining new and existing relationships with building owners, homeowners and General Contractors. Continuing Education Credit for Building License. Simple roof maintenance will prevent many of these problems on a majority of low-sloped roofs. Getting water off the roof as quickly as possible is very important. 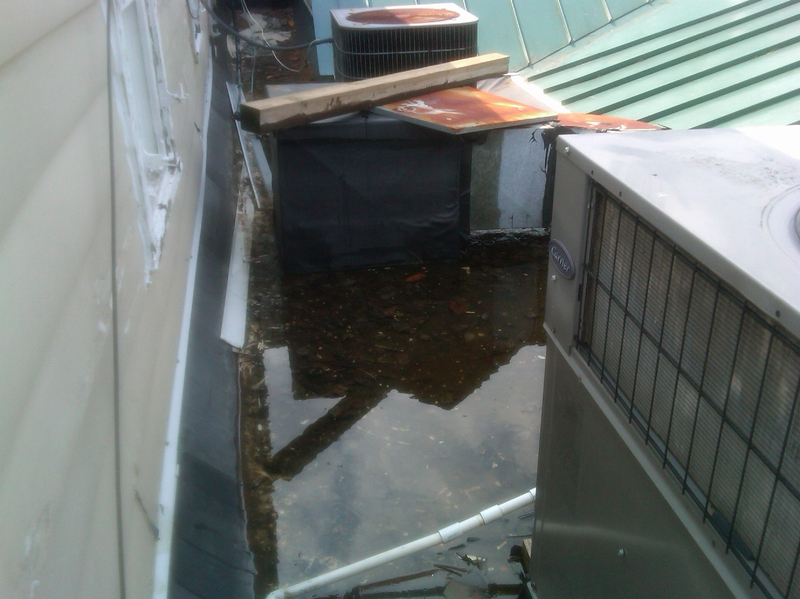 Especially on a flat roof, because when drains are blocked water will pond on the roof. This increases the chance for a severe leak to occur. It is important to have your drains cleaned at least 2 times per year. 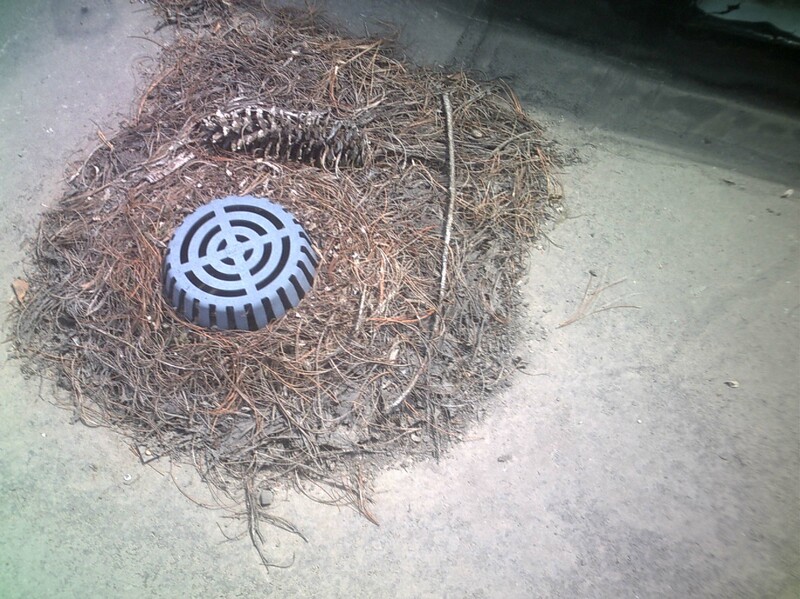 When your drains are blocked and after many heavy rain storms your roof will look like the first photo. If this amount of water finds a way into the building it is going to cause excessive damage to the interior. It is not uncommon for trash to end up on a roof. Kids love to throw there empty bottles on roof as they walk by. Occasionally these bottles make their way to your downspouts. This can result in a waterfall along your building. Standing water – if you have windows overlooking your roof, look out after a hard rain storm, water should be completely gone after 6-8 hours. If not, use a ladder to access the roof and check after a rain storm. Lingering water is an indication of problems and serves as a breading ground for mosquitoes. Clear drainage – look at the second and third images: organic or trash can block water paths and cause standing water and damage. Thoroughly clean – Flush with water to eliminate any lingering debris. 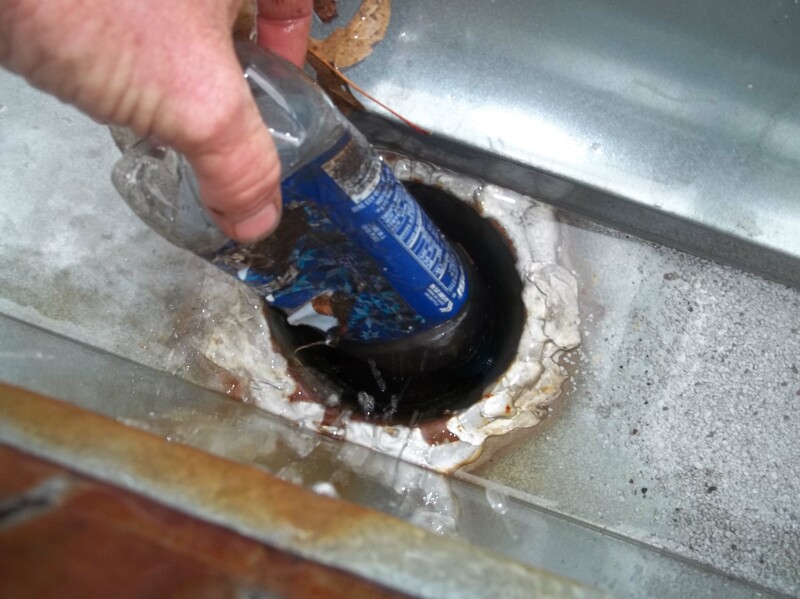 We offer drain, overflow and scupper cleaning and repair so you can keep your feet on the ground. Call us today to have your roof inspected and gutters cleaned. 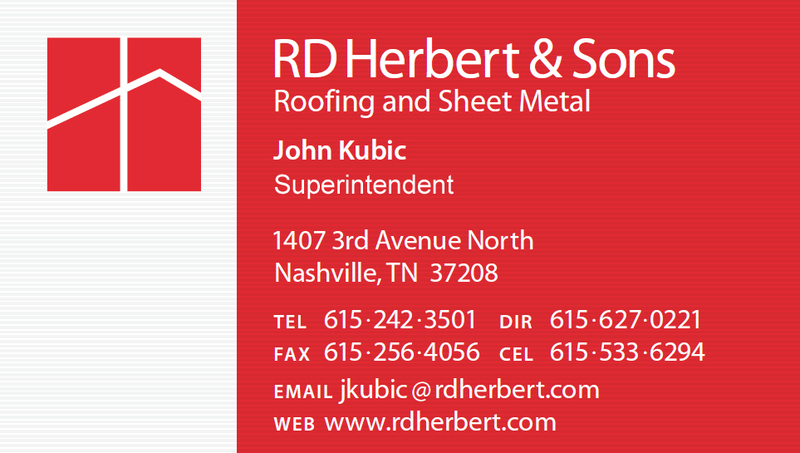 John has fifteen years in the roofing industry, the last ten years employed at RD Herbert. He enlisted in the US Navy after high school and joined the NMCB-7 construction battalion. Okinawa, Alaska, Bahrain and Puerto Rico are some of the areas where he spent four years building around the world. Five years ago, John moved up to project management and for two years he led the company’s safety program. He briefly moved his family to Colorado last year and spent his time Project Managing Government roofing projects on over nine million dollars of Garland Built-up products. Returning to Tennessee this spring, he rejoined our work force as Roofing Superintendent. His overall project coordination duties include job cost management, liaison between estimating team and building owners and General Contractors, scheduling, delivery coordination and reviewing progress of jobs on-site. Other duties include scheduling roofing crews, organization and management of workforce, employment and dismissals of workers, training new hires, monitoring job-site safety, quality of workmanship, and warranty requirements, maintaining and replacing necessary equipment and tools, and monitoring daily weather. Continuing Education Credit for Time Management and Organization. 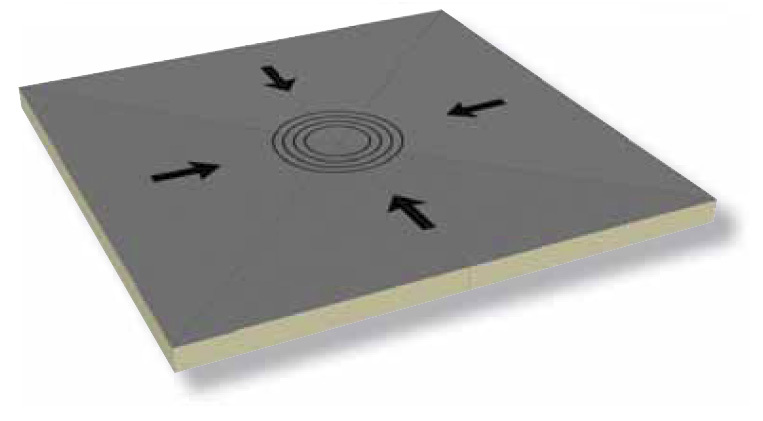 “Carlisle’s Hinged Target Sump can be used to add additional slope at the drain on structurally sloped decks or to start a four-way tapered design. It is factory-fabricated to ensure consistency and is available in a variety of slopes and thicknesses ranging from ½-inch at the low point, to 4½ inches at the high point. The Hinged Target Sump is available with Carlisle’s standard fiber-reinforced or high-performance SecurShield® glass mat facers. Custom thicknesses are available for optimum drainage. Excerpt from Carlisle Marketing Announcement. To learn more about this product, click the image below. RD Herbert is affiliated with Carlisle Syntec as an Authorized Applicator of their products but receives no direct compensation for this post. At The University of Tennessee in Knoxville, Matt earned a degree in Economics and a Minor in Business Administration. Matt manages the maintenance division for RD Herbert and Sons. 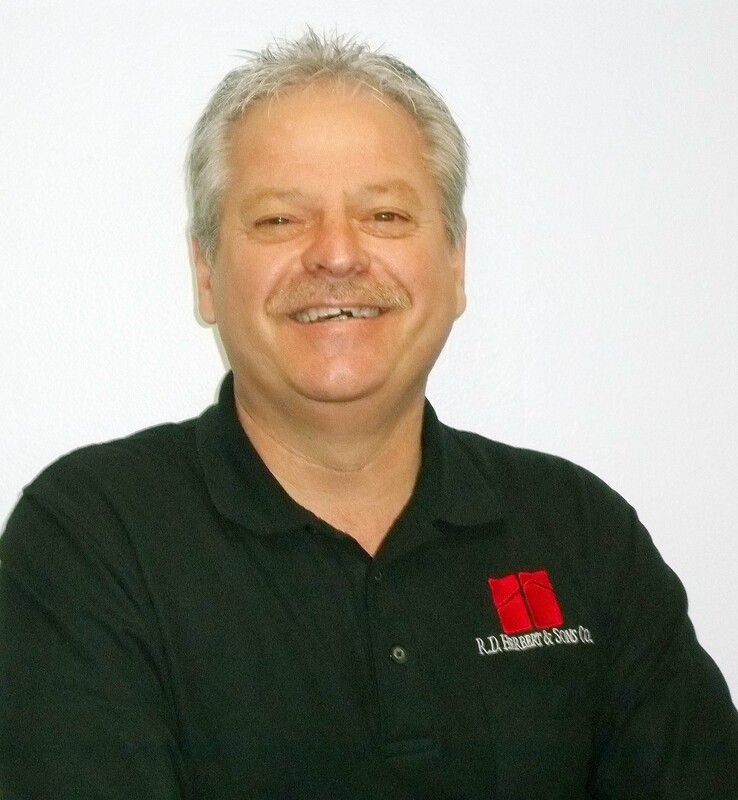 He has extensive training in leak detection, preventative maintenance, roof analysis, and customer service. Matt’s experience in the construction and building products industry totals 10 years with an emphasis on roofing, coatings, and building envelope solutions. Daily job duties include estimating repairs, scheduling the repair technicians, customer relations, and obtaining new clients for the company. The Maintenance Division’s goal is to provide the best experience for RD Herbert customers as possible. When someone calls the maintenance department they usually have a problem. The maintenance department’s goal is to provide a solution that fits the customer’s needs. While fixing leaks is our main job, we believe in Preventative Maintenance. PM is the single best way to extend a roofs life cycle. Check out our project gallery for a glimpse of our work. These include projects from Commercial, Residential, Green Roof, Architectural Sheet Metal and Custom Metal Fabrication. If you would like to see more on certain project, click on the photo and it will link to our website for additional photos and information. Remember that this is only a small sample of what our company is capable of doing.